Mercer’s U-23 Lightweight Men’s Pair (2-) is heading to the World Championships in Rot terdam!! 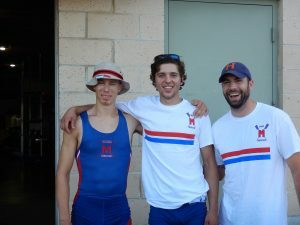 Rowers Jack Gleim and Kyle James, coached by Skip Kielt, qualified for the World Championships on July 21 by winning the trials event on Mercer Lake. The World Championships will take place August 21-28, 2016 in Rotterdam, the Netherlands. If you are interested in helping the Men with financial support, a rally me page has been set up for them through the National Rowing Foundation: https://nrf.rallyme.com/rallies/4343/usau23lm2 The Lightweight Men’s 2- is a non-funded event for the USA Team which means that the Men have to finance their trip themselves. Please support Jack and Kyle as they represent the USA, PNRA and Mercer Rowing at the 2016 World Rowing Championships.